NEW BEDFORD – It isn’t every day that three music icons take the stage to perform classic holiday favorites. 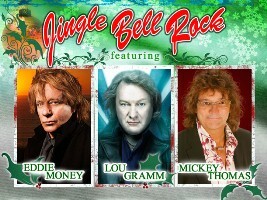 But Eddie Money, Lou Gramm and Mickey Thomas fans will get the opportunity to have themselves a merry little Christmas with a side of rock and roll this Saturday, Dec. 3, as the singers will bring joy to the Zeiterion Performing Arts Center in New Bedford for the Jingle Bell Rock tour. In addition to opening and closing the show as a trio, they will also play their own hit songs individually. Gramm, the former lead singer of Foreigner, agreed and said he is excited because he enjoys the holiday season, as well as New Bedford. Previously to joining Foreigner, he played in the band Black Sheep, which often gigged in the area. Thomas is set to sing “Winter Wonderland” in the style of Annie Lennox, Elvis Presley’s, “It’s Christmas Time Pretty Baby,” and “Silent Night.” He’ll perform Starship songs “Jane,” “Sara,” “We Built This City,” and “Fooled Around and Fell in Love,” which he originally recorded with The Elvin Bishop Band in 1976. “We might do ‘Nothing’s Going to Stop Us Now,’ if we have time,” he said. Thomas and Gramm anticipate the show will help people get into the Christmas spirit. For Thomas, his favorite thing about celebrating the holidays is cooking and being with loved ones. “You put differences aside and celebrate the birth of the Lord,” he said. Of course, they’ve each made wish lists for Santa. In fact, Thomas is confident he will be getting a set of golf clubs this year, as well as a few films. Action and adventure flicks such as “Scarface,” “Goodfellas,” the “Indiana Jones” trilogy and the “Godfather” movies are his favorites. Gramm is keeping his fingers crossed for a new pair of glasses, as the pair he has is in rough shape. “One side is broken to the point where it’s taped on,” he said with a laugh. He’s also hinting around for a set of new tires for his’68 Camaro Super Sport, one of his four muscle cars. But before Santa and his reindeer lavish them with gifts, they will share their holiday cheer with New Bedford. If the tour is a success, they said they would be more than willing to carry the tradition on next year. Thomas said Starship frequently performs private shows at which his “singer buddies” Mike Reno of Loverboy; Bobby Kimball of Toto; Jimi Jamison of Survivor; John Cafferty and the Beaver Brown Band join him on stage. He’s thinking about bringing some of those guys on board next year, as he is fond of touring. In the future, Thomas said Starship will be releasing a new album in February or March, which follows his recent solo recording of all cover songs, “Marauder”, while Gramm said he and the Lou Gramm Band will be putting out an album by spring. Their latest effort, which came out in 2009, was a self-titled Christian rock recording. “This one will be straight rock,” Gramm said. The Zeiterion Performing Arts Center’s box office is located at 684 Purchase Street, New Bedford, Mass. Tickets are priced at $69.50, $64.50, $55, and $48. Box Office Hours: M-F 10 a.m. to 5 p.m., Sat 10 a.m. to 3 p.m. and one hour before each performance. For more information, visit http://www.zeiterion.org.